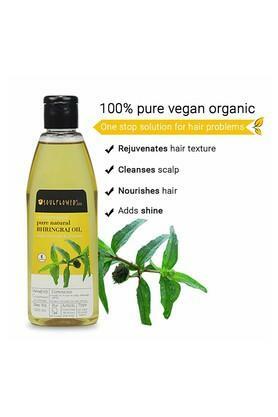 THE ULTIMATE SCALP COOLING OIL TO CONTROL HAIR FALL - Lightweight and non - greasy - 100% Pure, Natural and Vegan - Bhringraj, Coconut and Sesame Oil Enriched - Ideal for All Hair and Scalp - Free From Chemicals, Synthetic Colour or Fragrance Hair Fall & Damage Control! FOR HAIR The blend of Eclipta prostrate/Alba (Bhringraj) Flower Oil, Sesamum Indicum (Sesame) Seed Oil and Cocos Nucifera (Coconut) Oil can be easily absorbed by your scalp and hair. 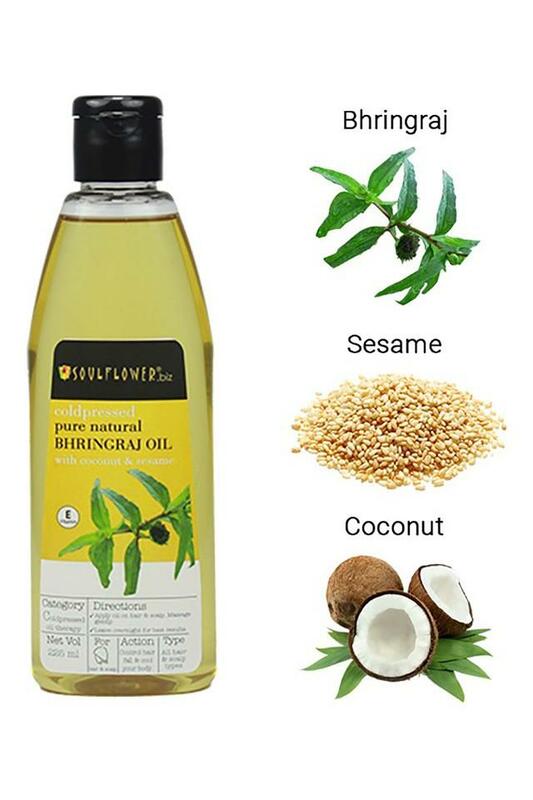 While it is commonly used to get healthy, attractive shine to your hairstyle, Bhringraj Oil works great in controlling severe hair loss, baldness and premature greying. It restores and strengthens damaged hair, soothes scalp irritation, protects your hair from the heat of hair dryers, curlers, and flat irons, deeply conditions hair and tames frizzy brittle hair. HOW TO USE - Apply Soulflower Pure Natural Bhringraj Oil With Coconut & Sesame and massage directly on your scalp and hair. 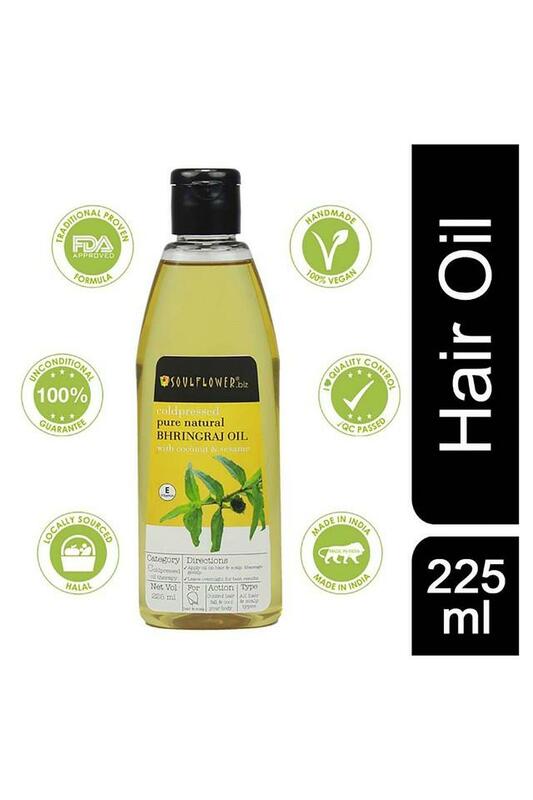 Leave overnight for better results. 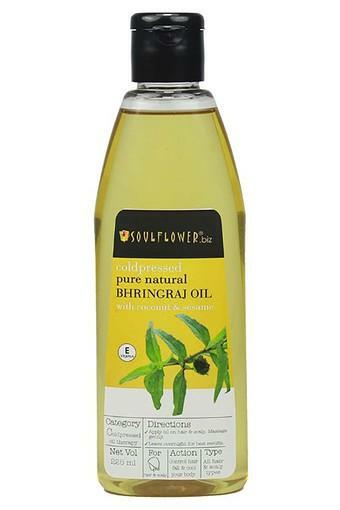 100% Pure, Natural, Vegan and Coldpressed Soulflower Bhringraj Oil With Coconut & Sesame is a cooling non-greasy formulation that controls acute hair fall, revitalizes hair follicles, reverses premature greying and offers stress relief.